Things that are distracting me, today. 1. Old-time Pottery: I love this store! Especially at the holidays. So many glittery, neat, little chachkis<sp> so little time! Have I mentioned I like shiny things? It’s a bit far, so I only make the trek (fifteen whole minutes!) a few times a year. Do you have a favorite store for holiday time? 2. Nostalgia: As I was thinking about Old-time Pottery, I started thinking about where we went at Christmas when I was a child, and I remembered Mid-town plaza mall in downtown Rochester. It was a wonderland! Even ordinary department stores had a little section like a fun house, but you walked along and saw holiday tableaux. 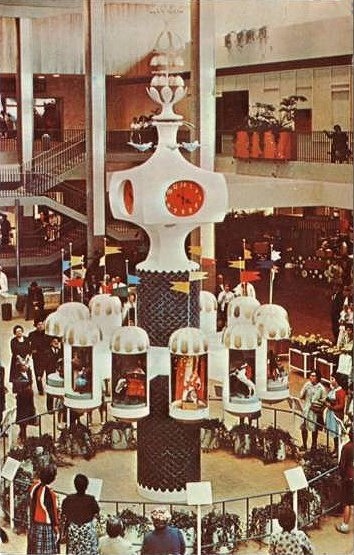 And near Santa was the clock–the Clock of Nations. Each little door would open and show children dressed in the clothes of their native land. And all around that, the most enchanting thing of all, a miniature monorail that circled the clock big enough for children to ride! It was the highlight of my year. 3. Birthdays: My kids’ birthdays are one week before and one week after Christmas, so I’m all about the cake, ’bout the cake, ’bout the cake, right now. And presents, too. What do you get the children who have everything, twice? Oy vey! What’s distracting you these days? Got some memories to share?